This image depicts part of a mural at the Peshtigo Fire Museum in Peshtigo, Wisconsin. 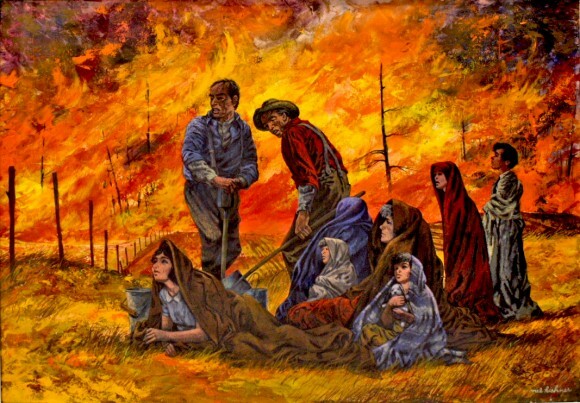 It reflects an artist's conception of the frightening scenes which occurred at Peshtigo during its Great Fire of 1871. At the moment I was entering the river, another woman, terrified and breathless reached its bank. She was leading one child by the hand and held pressed to her breast what appeared to be another, enveloped in a roll of disordered linen, evidently caught up in haste. Oh horror! On opening these wraps to look on the face of her child - it was not there. It was about ten o’clock when we entered into the river ... Once in water up to our necks, I thought we would at least be safe from the fire, but it was not so; the flames darted over the river as they did over the land, the air was full of them, or rather the air itself was on fire. No one was sure what was happening. People fled by foot. Where would they be safe? Even in outlying areas, like Sugar Bush, families were trapped (as depicted in this painting by Mel Kishner). The greater number seemed to have no idea of taking any steps to procure their safety, imagining, as many afterwards acknowledged to me, that the end of the world had arrived and that there was nothing for them but silent submission to their fate. The inferno had become a spreading holocaust. Bos, Carole "DEATH IN PESHTIGO" AwesomeStories.com. Sep 01, 2002. Apr 26, 2019. Does Advance Planning for a Disaster Minimize Loss of Life?